As electronics keep shrinking in size, several problems arise. One of these is that the copper wires that connect transistors to form complex circuits need to be very thin, but carry so much current that can cause them to break apart due to atoms being knocked out of place. 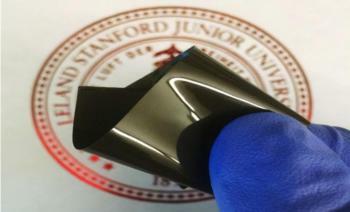 One way of solving this, studied by a group led by Stanford University, is to wrap copper with graphene. The group found that this can alleviate this major problem called electromigration. This was presented at a recent IEEE meeting that addressed the coming problems for copper interconnects and debated ways of getting around them. Growing graphene around copper wires can help prevent electromigration, and also seems to bring down the resistance of the copper wires. Generally speaking, the narrower the wire, the higher its resistance. “Interconnects have had to shrink while increasing the current densities by 20 times,” said Intel Fellow Ruth Brain at the meeting. Researchers at Stanford University have recently demonstrated a graphene-based high efficiency thermal-to-electricity conversion technology, called thermionic energy convertor. By using graphene as the anode, the efficiency of the device is increased by a factor of 6.7 compared with a traditional tungsten anode. This technology can work in a tandem cycle with existing thermal-based power plants and significantly improve their overall efficiencies. Hongyuan Yuan and Roger T. Howe, among the leading researchers in the Stanford team, explain that one of the major challenges for wide adoption of TECs is high anode work function, which directly reduces the output voltage as well as the net efficiency. The theoretical maximum efficiency for a TEC with a 2 eV work function anode is 3% at a cathode temperature of 1500 K, compared to an astonishing 10-fold increment to 32% with a 1 eV work function anode. Researchers at the Berkeley Lab and Stanford University have used graphene as the film of an ultra-sensitive camera system designed for visually mapping tiny electric fields in a liquid. The new platform should permit single-cell measurements of electrical impulses traveling across networks containing 100 or more living cells. 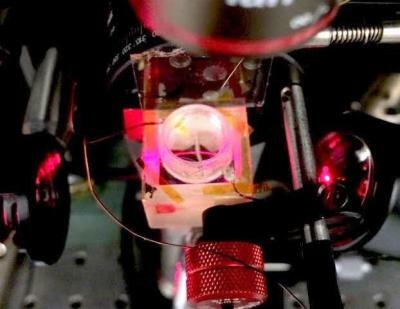 The researchers hope it will allow more extensive and precise imaging of the electrical signaling networks in our hearts and brains. Additional potential applications include the development of lab-on-a-chip devices, sensing devices and more. The team explains that the basic concept was examining how graphene could be used as a general and scalable method for resolving very small changes in the magnitude, position, and timing pattern of a local electric field, such as the electrical impulses produced by a single nerve cell. Other techniques have been developed to measure electrical signals from small arrays of cells, but these can be difficult to scale up to larger arrays and in some cases cannot trace individual electrical impulses to a specific cell. In addition, this new method does not perturb cells in any way, which is fundamentally different from existing methods that use either genetic or chemical modifications of the cell membrane. A team of scientists at Stanford University and the Department of Energy's SLAC National Accelerator Laboratory has come up with a possible answer to the question of how to make lithium-ion battery anodes out of silicon, as these tend to swell and crack, as well as react with the battery electrolyte to form a coating that harms their performance. The scientists wrapped each silicon anode particle in a custom-fit "cage" made of graphene, in a simple, three-step method for building microscopic graphene cages of just the right size: roomy enough to let the silicon particle expand as the battery charges, yet tight enough to hold all the pieces together when the particle falls apart, so it can continue to function at high capacity. The strong, flexible cages also block destructive chemical reactions with the electrolyte. Researchers at Stanford University have developed a revolutionary graphene-enhanced polyethylene film that prevents a lithium-ion battery from overheating, then restarts the battery when it cools. This new technology could prevent fires and melt-downs in a wide range of battery-powered devices. The researchers in this study recently invented a wearable sensor to monitor human body temperature, made of a plastic material embedded with tiny particles of nickel with nanoscale spikes protruding from their surface. For the battery experiment, they coated the spiky nickel particles with graphene and embedded the particles in a thin film of elastic polyethylene. They then attached the film to one of the battery electrodes so that an electric current could flow through it. The researchers explain that in order to conduct electricity, the spiky particles have to physically touch one another, but during thermal expansion, polyethylene stretches. That causes the particles to spread apart, making the film non-conductive so that electricity can no longer flow through the battery.